A chemist aiming to discover the elemental composition of a specific substance or solution can differentiate the atoms through emission and/or absorption spectroscopy. Both processes are geared to the observation of the electrons and photons when subjected to light. A spectrophotometer along with a light source is then needed in these processes. The scientist needs to have a list of values for both emission of absorption for each atom before subjecting the substance to spectroscopy. For example, when the scientist discovers a sample from a far-flung area and aims to learn the composition of the matter, he may opt to subject the sample to emission or absorption spectroscopy. In the absorption spectra, he is supposed to observe how the electrons of the atoms absorb the electromagnetic energy from the light source. When the light is directed towards atoms, ions, or molecules, the particles tend to absorb wavelengths that can excite them and cause them to move from one quantum to another. The spectrophotometer can record the amount of absorbed wavelength, and the scientist can then refer to the list of element characteristics to determine the composition of the sample gathered. Emission spectra are performed with the same process of light subjection. In these processes, however, the scientist observes the amount of light or heat energy emitted by the photons of the atom that makes them go back to their original quantum. Think of it this way: the Sun is the center of the atom, consisting of photons and neutrons. The planets orbiting the Sun are the electrons. When a giant flashlight is directed towards the Earth (as an electron), the Earth becomes excited and moves up to the orbit of Neptune. The energy absorbed by the Earth is recorded in the absorption spectra. When the giant flashlight is removed, the Earth then emits light in order for it to go back to its original state. In such cases, the spectrophotometer records the amount of wavelength emitted by the Earth in order for the scientist to determine the type of elements comprised by the solar system. In addition to this, absorption does not need the excitation of the ions or atoms, unlike emission spectra. Both need to have a light source, but these should vary in the two processes. Quartz lamps are usually used in absorption, while burners are suitable for emission spectra. Another difference between the two spectra lies in the “print” output. In developing a picture, for instance, the emission spectrum is the colored photograph, while the absorption spectrum is the negative print. Here’s why: emission spectra can emit light that extends to the different ranges of the electromagnetic spectrum, thereby producing colored lines with low-energy radio waves to higher-energy gamma rays. Colors in the prism are usually observed in these spectra. On the other hand, absorption can emit several colors coupled with blank lines. This is because the atoms absorb light at a frequency dependent on the type of elements present in the sample. The re-emitted light in the process is unlikely to be emitted in the same direction the absorbed photon originated from. 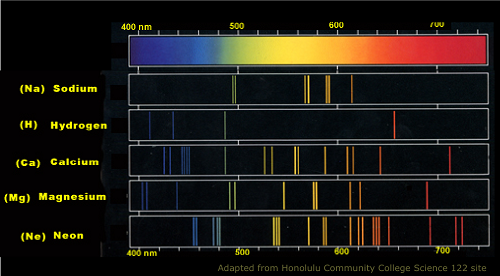 Since the light from the atom cannot be directed towards the scientist, the lights appear to have black lines due to the missing waves in the electromagnetic spectra. 1.Emission and absorption spectra can both be used in determining the composition of matter. 2.Both use a light source and a spectrophotometer. 3.Emission spectra measure the wavelength of the emitted light after the atoms are excited with heat, while absorption measures the wavelength absorbed by the atom. 4.Emission spectra emit all the colors in the electromagnetic spectrum, while absorption can have a few colors missing due to the redirection of the re-emission of absorbed photons. Celine. "Difference Between Emission and Absorption Spectra." DifferenceBetween.net. July 6, 2017 < http://www.differencebetween.net/science/difference-between-emission-and-absorption-spectra/ >.